The Samsung Galaxy S8 and S8+ stand as one of the most successful flagship of Galaxy series. It is one of the most stylish smartphone you will come across. Today, we will talk about how you can track and locate lost Galaxy S8 or S8 Plus, if it’s stolen or you have misplaced it. Samsung Galaxy S8 is present in 5 colors in the market. It comes with a 5.8-inch display screen. The front camera is of 8 MegaPixels. The rear camera is dual pixel with 12 megapixels. There are two variants, one comes with Snapdragon 835 and the other one comes with Exynos 8895 processor. Running on Android Nougat, Galaxy S8 has 3000 mAh battery with wireless charging support and fast charging. There are two services which can be used to locate lost Galaxy S8. One is from the Samsung itself, it requires you to have a Samsung account. Another service is from Android. It is present on every Android device. Using the methods below, you can track your lost Galaxy S8 on Google maps. You can also erase all the data present inside. If your phone is lost inside the home and it is on silent. You can use these services to make it ring its maximum volume. These features are really necessary to protect your personal data present inside your Galaxy S8 if it is lost. It will make sure your private information does not fall into wrong hands. The Samsung’s Find my Mobile is a service introduced to perform a number of features on your phone remotely. It can also be used to unlock your phone or retrieve call logs of your lost Galaxy S8. It also allows you to locate lost galaxy S8 by displaying its location on Google Maps. Find my Mobile service allows you to delete all your registered cards and payments methods along with details from your lost Galaxy S8. In order to make use of this service. You must have Samsung Galaxy account registered on your phone. If you have every used galaxy apps or Samsung services. you must have created your account. Now let’s move on to the guide on how to track and find lost Galaxy S8 using find my mobile service. Log in using your Samsung account username and password. If you don’t remember your credentials. You can use find email/password option to get access to find my mobile. Once you have signed in. You will see a number of operations you can perform on your Galaxy S8 remotely. If you want to see your phone on Google maps, just click on locate my device and it will show you the location of your phone where it was last online. If there are no chances of getting back your Galaxy S8 and you have lost your hope to locate lost Galaxy S8. You can wipe the data present in it including your credit cards and payment details. Everything will be wiped. You can also make it ring at its maximum volume if you know your phone is not stolen, it is near somewhere. You don’t need to pull over your furniture. Using Ring my device you can make your phone ring even if its silent. Another approach to track your lost Galaxy S8 is via Android-based service. It can be accessed from any Android device and it allows you to perform a number of things on your Galaxy S8 remotely. 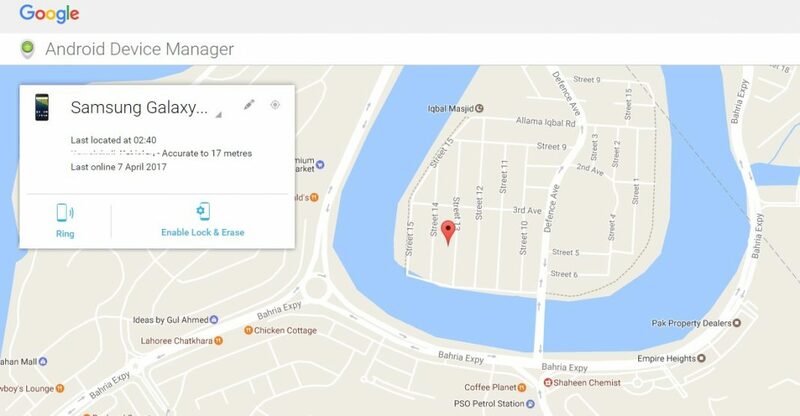 You can access Android device manager on the browser of your computer or some other phone which has access to the internet. Using the Android device manager you can make use of following services. Ring: If you are certain your phone is present inside the home or office. It is on silent so you cant ring it and find it. Use this feature to make it ring on its highest volume. Locate: You can see the exact location of your phone on google maps using this service. It has limitations. Your phone must be connected to the internet and its location services should be on. Lock: If you forget your phone somewhere and you have hope that someone might find it and try to contact you. Use this feature to lock down your phone and display a custom message on its screen along with your contact number. Erase: If you are certain that you will never get your phone back and you have lost every hope to see it back ever again. Use this feature to completely wipe all the data present inside it. After erasing your phone. You won’t be able to access it via the Android device manager. First of all. Go to the Android device manager website or download its app on your smartphone. A login screen will appear. Now enter the same email address that you used to set up your phone for the very first time. Once done. Select your phone from the list. Now, you will see a map and name of your phone like in the screenshot below. If your phone is online. You will see its current location on Google Maps. If it’s offline you can still use the service to erase its contents. Next time someone opens the phone. All the data present on your phone will be erased. Moreover, you can also use the lock option to put a password on its screen along with a message. So if anyone finds it. That person can read the message and deliver the phone back to you. 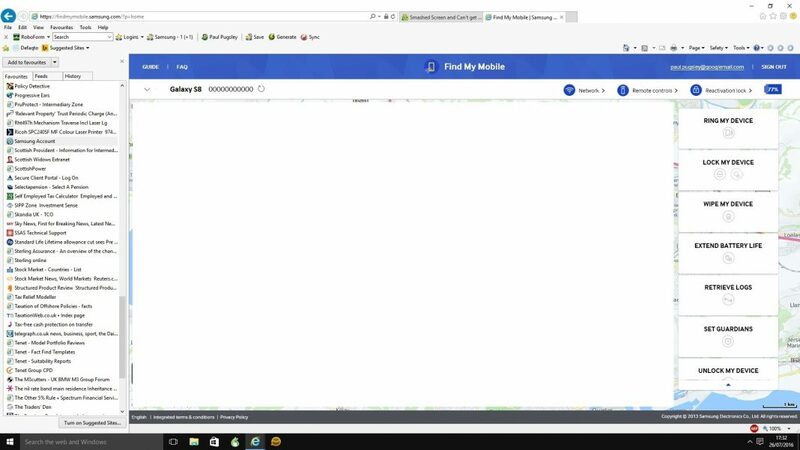 Android Device Manager showing the location of Galaxy S8 on Google Maps. All these services have their limitations. Most of the services only work if your phone is connected to the internet. Moreover, there are a number of other apps like Cerberus that let you locate lost Galaxy S8 without internet but they should be preinstalled on your device before it got lost. So for the next time, use security apps. That’s all we have on how to track and locate lost Galaxy S8. I hope that you guys were able to find your lost Galaxy S8 or S8+ using this guide. If you have any further questions, feel free to ask me in the comments. Your feedback is highly appreciated.